Liz Laribee is the Director of the MakeSpace, a collaborative arts organization she spearheaded the founding of in 2012. Through that position, she has helped mobilize a series of creative projects in the city of Harrisburg, Pennsylvania. She is a freelance artist, specializing in reuse and alternative materials in the creation process. Liz has exhibited her work in Harrisburg, in national and international print media, and at the Philadelphia Mausoleum of Contemporary Art. For the past six years, she has taught reuse methods of art-making in classrooms at the University level, in public and private schools, and in after-school programs. 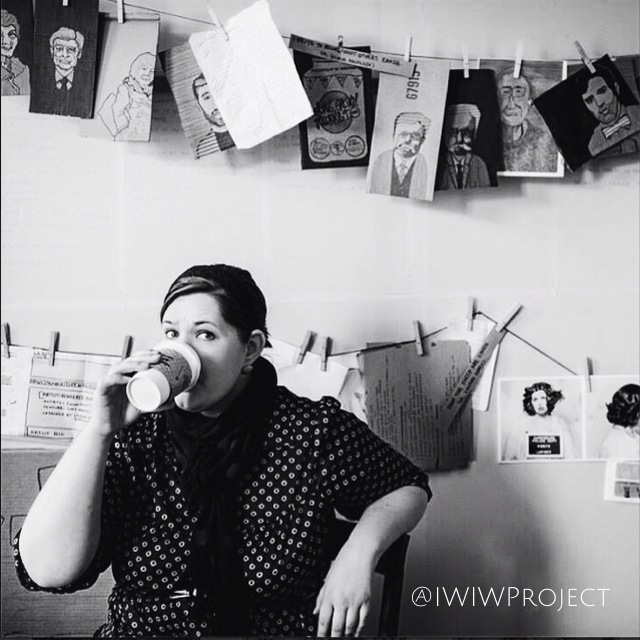 Some of her current collaborations include Sprocket Mural Works, a citywide initiative to generate and document public art, a children’s book series with poet July Westhale, and DCBA Lawyers for the Arts, a program to enable lawyers to assist fledgling artists with stabilizing their projects. Born in Kansas, Liz’s father was an Episcopal priest and interim pastor at churches who were struggling. Because of his work, she moved 17 times before attending Messiah College in Harrisburg. Though she had been accepted into Savannah College of Art and Design, she focused instead of creative writing and graduated from Messiah College with an English degree. Q: You are involved in some creative, community-oriented projects like MakeSpace and Saint Stephen’s Episcopal Cathedral. What is your vision and how has that evolved? LL: My avenue into Harrisburg was an intentional community called The Sycamore House. I helped start that when I was a Junior in college through The Episcopal Cathedral. The model back then was that people would live in community together, with a commitment to the surrounding city. Your rent and utilities were paid for in exchange for community service and teaching the youth group. I moved into the community and stayed for 2 years. It was impactful and informative. I entered the city with eyes open and the intention to learn about the City and to impact it positively. Experiments around the idea of community and grassroots efforts to make things happen was really hammered into my head in college and so, when I moved into Harrisburg, it continued that way. In 2012, five years after graduation, it was a strange time in Harrisburg history—there was Occupy Harrisburg, David Unkovic had been appointed as the receiver and had a really quick turn around and then resigned. When that happened it was sort of like Batman quit. My temperament is that when I get discouraged, I redirect my energy into making something. I was invited around that time to a community meeting at the Pancake Mansion and I met this vibrant community of people who were trying to establish the “next thing” in Harrisburg and trying to pool our diverse resources and talents to create something more constructive in Harrisburg. We became aware of the property that MakeSpace is now in when I called my landlord who had the property. The philosophy was to use what we had available to us, which was very little money, but a lot of resourcefulness and a lack of inhibition. It lends itself to the whole thing being an evolving art project. As far as a larger vision that I have…this is a strange time of life to be talking about my vision! I feel like this is the year that I’m slowing down, in a good way, a purposeful, mindful way, but my vision is just trying to love where I live. Trying to figure out a way to make that possible for myself and the others around me. Q: Can you explore that a little more. Do you love where you live? What are a few of the things you need to be happy? LL: I DO love where I live. What I mean by trying to love where I live means trying to piece together the elements that go into a life that I can thrive with. I need friends, coffee, a means to make and sell what I love to make and sell, and I need to be in community with the people around me. If those elements are in place then that, to me, will equal a happy life. I think my language has gotten more personal the longer I’ve done this. At the very beginning, it was about “saving Harrisburg”, but over time it has become a little less…arrogant. It’s more about living a mindful life and liking who I am and those around me. Q: Has that always been possible for you? To lead a mindful life? How has that idea changed over your life? LL: I think one of the biggest changes I’ve see in myself is trying to learn how to hone in on the most practical and most joyful way to lead a mindful life. You start off really unfocused and think you can do anything, like we all write that in each other’s yearbooks, but over time, that becomes less interesting. You become less interested in trying to be absurdly prolific—you start to focus on quality and quantifiable, measurable results. Q: I cannot wait to check out MakeSpace (and to bring my tinker boyfriend over). Tell me some of the stories from MakeSpace. LL: There have been so many stories. I had met this guy once, maybe 15 years ago, and because of Facebook, he messaged me and said that “I met this Klezmer band while I was in Europe and they’re in the states and they want to play at MakeSpace.” It was one of the most incredible live performances I’ve ever seen and it was so emotional for me that it was happening in the MakeSpace. They performed and their stomping nearly brought the floor down. The next day I had to sweep a bunch of euros off the floor. They left euros in their wake! We renovated the space with our own sweat equity and elbow grease. There was a room off the kitchen that was totally not insulated—you could almost see through the walls, so we left it vacant as a meanwhile space until a neighborhood artist named Stephen Michael Haas asked to experiment with an installation in that room. He spent three days with primer and India ink and turned it into this incredible piece of installation art. He did a mural on every bit of space. It’s this imitate autobiographical statement of his life and it’s become one of the staples of the experience at MakeSpace. It was an incredible way to redeem the space with nothing but a person’s resources, spirit, and time. Q: How do you make time for yourself? What gives you balance? LL: What I love to do to get time away is to go away. I travel a lot—I take two big trips each year. It’s necessary for me; I have wanderlust. I like reminding myself of a larger world and contexts that are totally separate from my daily to-do list.. I don’t owe anyone in the Turkish airport any emails. I also really love going to the River and sitting on the steps and not bringing my cell phone with me. And m y new house has a balcony off of my bedroom, so I spend a lot of time there. Q: What is something that the world should know? Maybe the best piece of advice that you ever received or the message you have for others. LL: Be excellent to each other. I think that’s my best advice—it’s dependent on no resources other than yourself. Q: What do you think is the capacity of someone’s internal resources? LL: People are limited by expenditures of their own time and energy and the disadvantages that come from larger systems, but how you treat people is your choice. Q: How has the way you treat people changed based on your experience? LL: Well, I’m more interested in listening than speaking these days. Some arrogance is wearing off. I’m trying to be more cautious about what it is that I put into the world and how that happens. Q: What question did I miss? LL: It’s probably what is your name an anagram for! And the answer is LIBERALIZE.